To learn more about Yelena, the babies' surrogate, visit her amazing website. I’m a writer by trade. This means I usually pack a lot of information in as few inches of text as possible. Why? Short attention spans. 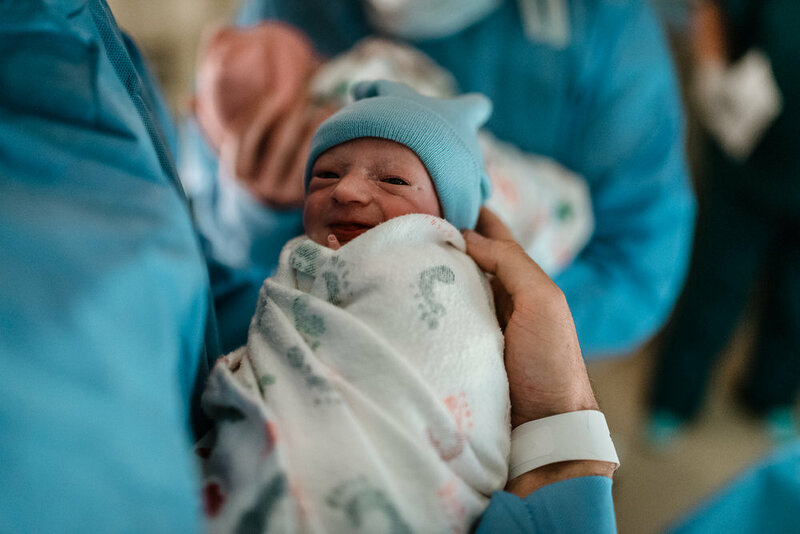 But this post deserves inches galore in order to get a very specific point across: if you have the patience to get through these 1,200 words, you will have experienced just 1/1,000th of the patience and commitment needed to have a baby via surrogacy. Give me 5 minutes of your time and I’ll tell you about an amazing surrogacy journey years in the making. Let me preface by saying that I can only speak to my part in this story. I was the baby oven. The couple’s journey was far longer with its own unique set of emotional, physical and financial challenges. Becoming a surrogate was not an insta-decision. Ten years ago doctors said I may have trouble getting pregnant. I had polycystic ovarian syndrome and was morbidly obesity. Five years later and 150 pounds lighter, I got pregnant a month after we started trying. 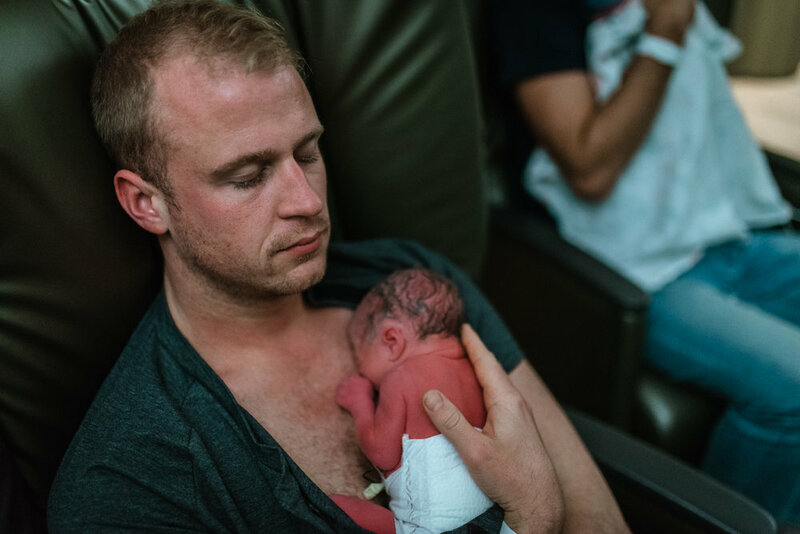 Having a child is unlike anything I’ve experienced (and I’ve experienced some amazing things), and it’s hard to really understand that until you’re holding your newborn child. Fast-forward about four years. I saw a Facebook post about surrogacy and thought, “What if I could use my newfound health to help someone experience parenthood?” And from that moment, no one could talk me out of it. Through a referral from a friend, I connected with a wonderful agency in Chicago that would help match me to a couple. When being matched, you definitely want to work with someone who feels “right” since you’re dedicating so much time to the process and putting your health at risk. I was looking for someone optimistic and easygoing. I picked Zach and Devin for these reasons and so many more. When you choose a couple, many ‘what ifs’ follow: what if their clinic doesn’t accept me due to my medical history? What if the couple doesn’t want to work with me? What if we ultimately don’t click? What if the embryos don’t stick? It’s a leap of faith for all involved. After our first Skype ‘date,’ I was extremely excited and hopeful they would choose me as their surrogate. Looking back now, I feel so lucky that Zach and Devin picked me. Once matched, I went through physical and psychological evaluations to make sure I was prepared for surrogacy. We got through the contractual paperwork fairly quickly (which is not always the case for other matches). Most importantly, we agreed on the primary issue: they will take the babies and I will not. Once the paperwork was signed, I started giving myself shots to prepare for embryo transfer. I gave myself a shot every morning for one month – I am still surprised I had it in me to do that! Anyone who has ever gone through the in-vitro fertilization process understands all too well. On September 26, 2017, the doctor in Chicago transferred two embryos – one boy and one girl. The eggs came from one donor (not me) and the sperm came from both fathers, meaning each father would have a biological child and the twins would technically be half-siblings because they have the same biological mother. The hardest part came next: the two-week wait to find out if I was pregnant. I did everything I could to provide these embryos with the most inviting uterus they have ever encountered. I peed on more pregnancy tests than I want to admit. With each pregnancy test, the positive line got darker and darker. We felt both hesitant and excited. It wasn’t until we saw two little gummy bears on the first ultrasound that it really sunk in that we were pregnant. At first the weeks went by slowly. I was very sick until well into the second trimester. I couldn’t look at food without throwing up. I went through some pretty difficult things physically but I woke up every morning, stood in front of the mirror and told myself, “Just one more day.” When you are doing something for a greater purpose, you surprise yourself with how much you can handle. Zach and Devin were extremely supportive and loving toward me — a random stranger that decided to infiltrate their life during a very vulnerable time. I honestly could not have asked for more support from them and their family. They kept in constant contact throughout the pregnancy, drove five hours each way for many ultrasounds and included me in their baby shower. Once we hit the third trimester, reality set in that two amazing humans were about to make their debut. 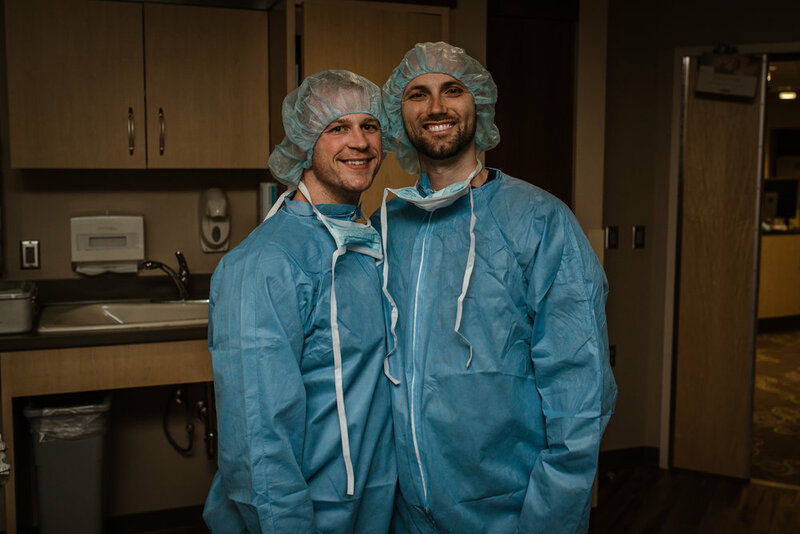 Throughout the pregnancy, I made it clear that I wanted to have as natural of a birth as possible and Zach and Devin were supportive. 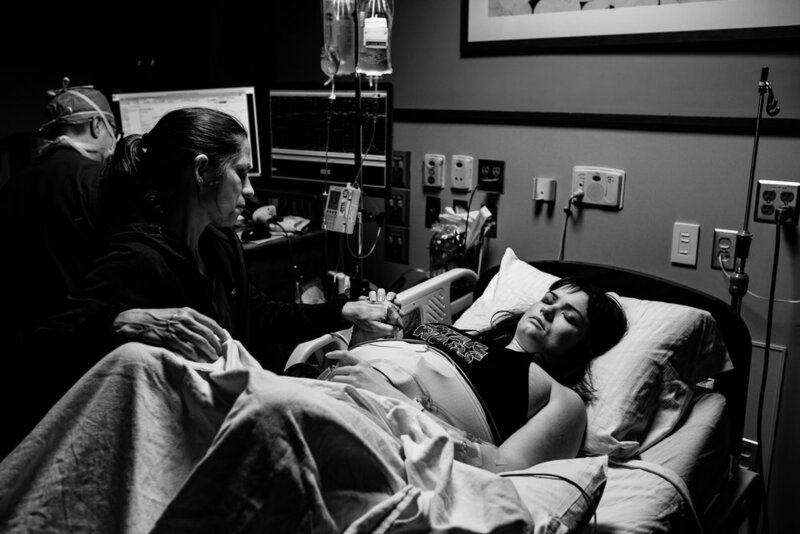 I had my son at a birthing center and was unmedicated. Although twins pose many more challenges than a singleton, I still wanted to have a vaginal birth if the stars aligned. During my 35th week, the dads decided to travel to the Twin Cities and camp out so they could be present for the labor. The following week, a doctor recommended induction to make sure both babies could continue growing properly outside the womb. I knew that an induction could potentially mean using Pitocin and inevitably an epidural, so we decided to break my water first to see if we could get the labor started without meds. After breaking my water, I went through about 10 hours of contractions until they slowed to a stop. Pitocin was our only choice to get things going and boy did it ever! My sister, doula, Zach and Devin helped me tremendously throughout the worst of it. 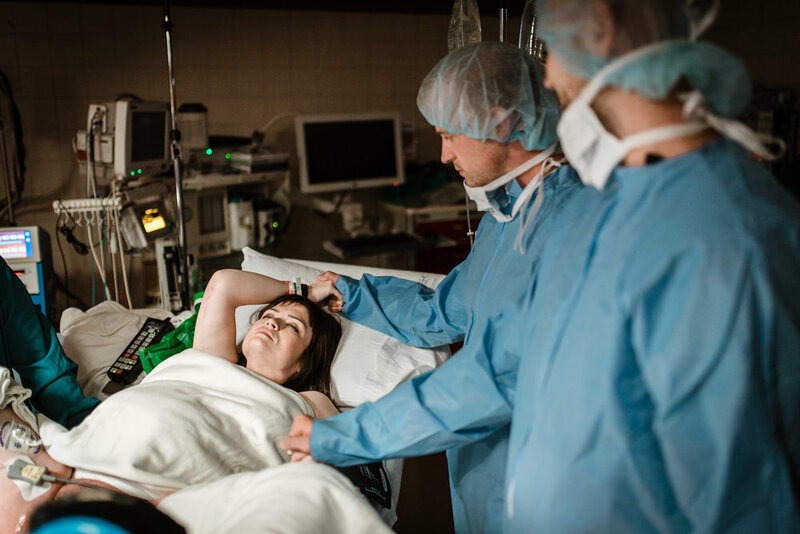 Although I really wanted to have another unmedicated labor, the pain of the Pitocin-induced contractions was too much to bear. I got an epidural and let me just say, that option (when needed) is magical! Within a few hours, I was ready to give birth and was wheeled into the operating room (where twins are delivered due to the possibility of complications). The dads and Meredith, our birth photographer, joined me. I am so incredibly happy that we decided to hire Meredith because these are moments we could not have captured on our own. 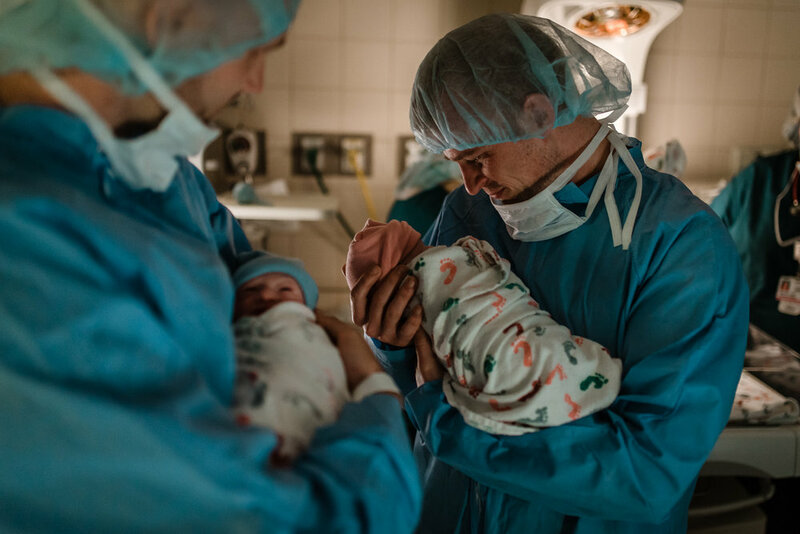 The twins were born vaginally eight minutes apart in the early morning hours of May 20, 2018. Kai and Claire weighed 4lbs 8oz and 4lbs 10oz, respectively. 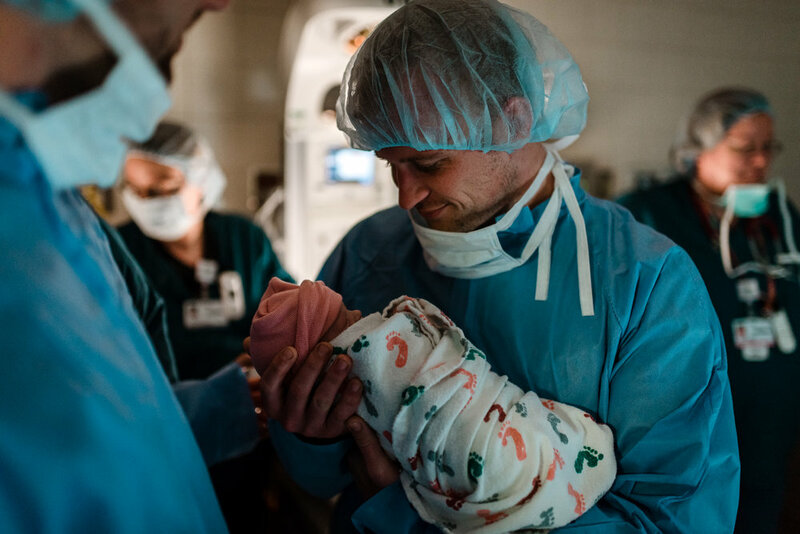 Neither of them needed oxygen or a feeding tube – just a little time in the NICU to adjust to feedings and pass all necessary tests. Welcome to the world, Kai and Claire! We're oh so glad that you're here. Interested in learning more? Contact Meredith!